GoPro has finally released the successors to its GoPro Hero4 series but there are only two models to choose from this year. 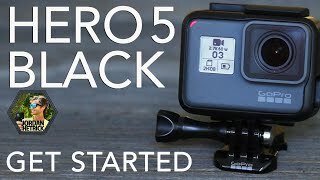 Here we will discuss everything about the GoPro Hero5 Black including GoPro Hero5 Black Cairo price and specs. Compared to the GoPro Hero4 Black, there is no major change in shape. However, users can now enjoy up to 33feet waterproof without inserting the camera inside a waterproofing case. One of the tradeoff that comes with this feature is that the port covers are now watertight and can be difficult to open sometimes. That’s not all, there is a 2-inch touchscreen included in the camera as well which was missing in the previous camera. It’s like a combo of the Hero4 Black and GoPro Hero4 Silver as you get 4K recording feature as wel. Some of the competitors that you can check out without waiting for the GoPro Hero5 Black release date Egypt are the Xiaomi Yi Action Camera or Garmin Virb. The price range of these cameras are different compared to the GoPro Hero5 Black Cairo price. It’s just not great video quality that you get with this camera but it also comes with advanced video stabilization which makes all the captured videos really smooth. It also supports voice control and you can take burst shots or images while recording using simple voice commands. There is only one button which makes controlling the camera really easy. There is a GoPro Plus subscription which you can try if you want your camera to upload videos and photos automatically to the cloud. Other notable features are: 12-megapixel photo, GPS, stereo audio, RAW WDR photo and exposure control. The starting price of this action camera will be around EGP 7000 when it’s here. It’s already here so you don’t have to wait for the GoPro Hero5 Black release date Egypt. The hero 5 black Digital Camera is manufactured by GoPro and was added around April 2017 and is part of the GoPro Hero 5 Black series. This version of the Digital Camera comes in Color : Black , Image Resolution : 12 MP , Display Size : 2 Inch , Special Features : Touch Screen , Special Features : Wireless. The model comes in 6 other variations including combination of Black Color , 2 Inch Display Size , 12 MP Image Resolution , Touch Screen, Wireless Special Features. The best price for the GoPro Hero 5 Black in Egypt is EGP 5999 sold at Souq and available with free shipping and delivery within Delivery in 3-7 days. By comparing prices and buying from the cheapest store you can save up to 29% or EGP 2500. 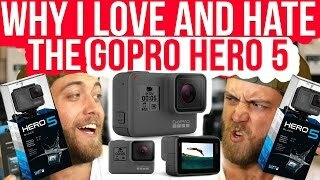 GOPRO HERO 5 BLACK Review - Is it worth it?! 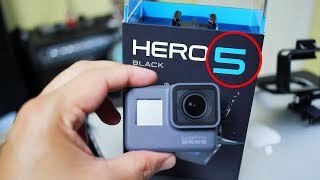 GoPro HERO5 Black Review Overview! Price has decreased 36% from EGP 8495 on 2017-04-25 to EGP 5399 today.